FIRST IN PLAYBOOK — A NEW WORLD ORDER? TAKING ON THE GUN LOBBY: GIFFORDS PAC is going to spend nearly $1.5 million on a TV and digital ad targeting vulnerable Colorado Republican Rep. Mike Coffman. Coffman has an “A” rating from the NRA and the group has contributed heavily to his reelection efforts. The ad titled “The NRA loves Mike Coffman” features a hypothetical text conversation between a child and their mother during a school lock down. Good Sunday morning. TRUMP’S UNGA WEEK AHEAD – Monday: President Trump will speak at the “Global Call to Action on the World Drug Problem” event and will also hold a reception for heads of state. … Tuesday: Trump will address the UN General Assembly. He will also have a “pull-aside” meeting with UN Secretary-General Antonio Guterres and attend a luncheon hosted by Guterres. He will have a pull-aside with Maria Fernanda Espinosa, the president of the 73rd session of UNGA, and will also attend Ambassador Haley’s Security Council presidency reception. … Wednesday: He will speak at a “POTUS-chaired” UN Security Council briefing on counter-proliferation. — AT UNGA, Trump is confirmed to also have bilateral meetings with South Korean President Moon Jae-in, Egyptian President Abdel Fattah Al Sisi, French President Emmanuel Macron, Israeli Prime Minister Benjamin Netanyahu, Japanese Prime Minister Shinzo Abe and UK Prime Minister Theresa May. UnitedHealth Group is honored to have recently been named to the 2018 Dow Jones Sustainability North America and World Indices – the leading measures of sustainable business practices globally – for the 20th consecutive year. Learn more. ROSENSTEIN FALLOUT … “Trumpworld divided on Rosenstein — not whether to fire him, but when,” by Annie Karni and Eliana Johnson: “The dissension among the president’s strongest supporters underscored again how they are far from one happy family. The talent at Fox News remain intensely competitive with each other. Meanwhile, their advice, delivered personally to Trump or on-air, is often greeted with eye rolls by White House officials working in the West Wing, who dismiss much of what they say as nothing more than self-interested ploys to gain ratings or sell books. Hannity, according to a source familiar with his thinking, does believe that Trump should fire Rosenstein — eventually. COMING ATTRACTIONS — “Republicans boot their headaches until after midterms,” by Burgess Everett and Rachael Bade: “Congressional Republicans have found a solution to all their internal problems that plague their party: Delay them until after the midterms. 2018 WATCH — “Democrats run on pre-existing conditions — their own,” by Alice Miranda Ollstein: “Democratic candidates are getting very personal on the campaign trail as they push to preserve Obamacare, frankly sharing tales of their own health struggles. UnitedHealth Group is honored to be named to the Dow Jones Sustainability North America and World Indices for the 20th consecutive year. Learn more. THE TRUMP ADMINISTRATION — “Poorer immigrants would face new hurdles under Trump proposal,” by Ted Hesson, Nancy Cook, Helena Bottemiller Evich, and Andrew Restuccia: “The Trump administration proposed expanding its pre-election crackdown on immigration by denying green cards to legal immigrants if they or their dependents have received government assistance. Under the new rule, which the Department of Homeland Security posted online Saturday, immigrants can be denied so-called ‘lawful permanent residency’ if they’ve received certain government benefits–or if the government anticipates that they may do so in the future. VALLEY TALK — “White House distances itself from reports that Trump could target Facebook, Google and Twitter with a new executive order,” by WaPo’s Tony Romm and Josh Dawsey: “For weeks, top tech com­panies have been on edge, fear­ing that the Trump ad­min­is­tra­tion could seek to regu­late the in­dus­try in re­sponse to the president’s tweets at­tack­ing so­cial media sites for si­len­cing con­ser­va­tives online. Their worst sus­pi­cions seemed to come true Fri­day night, with the e­mer­gence of a draft ex­ec­u­tive ord­er that called for near­ly every federal a­gen­cy to study how com­panies like Facebook police their plat­forms and re­fer in­stan­ces of ‘bias’ to the Justice Department for further study. FOR YOUR RADAR — “Former top White House official revises statement to special counsel about Flynn’s calls with Russian ambassador,” by WaPo’s Shane Harris and Devlin Barrett: “A former top White House official has revised her statement to investigators about a key event in the probe of Russian interference in the 2016 election, after her initial claim was contradicted by the guilty plea of former national security adviser Michael Flynn, according to people familiar with the matter. K.T. McFarland, who briefly served as Flynn’s deputy, has now said that he may have been referring to sanctions when they spoke in late December 2016 after Flynn’s calls with Russia’s ambassador to the United States, these people said. 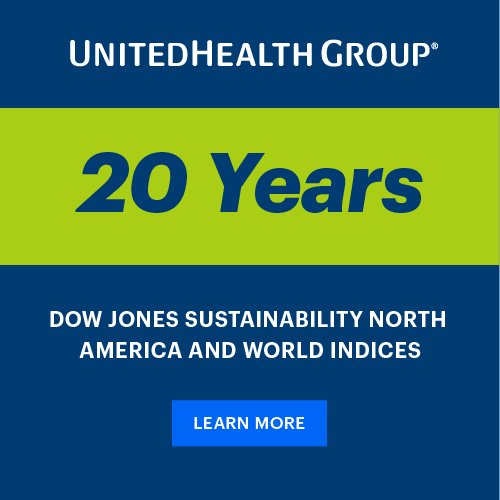 Learn more about why UnitedHealth Group was named to the Dow Jones Sustainability Indices. — ALSO SPOTTED AT THE NSO GALA: David Rubenstein, Deborah Rutter, Adrienne Arsht, Ambassadors of the U.K., Italy, Latvia, Japan and Liechtenstein, Sen. Roy Blunt (R-Mo.) and Abby Blunt, Sen. Richard Shelby (R-Ala.) and Annette Shelby, Sen. Patrick Leahy (D-Vt.), Reps. Barbara Comstock (R-Va.) and Don Beyer (D-Va.), VA Secretary Robert Wilkie, DNI Dan Coats, Jana Toner, Christine Lagarde, Ted and Annette Lerner, Patrick Steel and Lee Satterfield, Brendan Sullivan, Bob Lighthizer and his daughter Claire, Buffy Cafritz, Brett and Ginger Loper, Jon Peede, Bradley Akubuiro, Marcia Lee Kelly, Gail Baker, Michael and Noémi Neidorff and event co-chairs Jennifer and David Fischer and Anita and Tim McBride. At UnitedHealth Group, our mission is to help people live healthier lives and to help make the health system work better for everyone. We advance this mission through social responsibility, sound economic practices, and environmental stewardship—as recognized by the Dow Jones Sustainability Index for the 20th consecutive year. Our 285,000 employees and our partners combine their knowledge, experience and compassion in support of initiatives that help build healthier communities. Learn more about UnitedHealth Group’s sustainability initiatives.